I apologize in advance for what you’re about to see. It’s not pretty, and frankly, it probably doesn’t belong in a family-friendly forum like this. Hopefully your small children are in another room – if they’re not you might want to cover their eyes or otherwise distract them before scrolling past the photo below. I don’t want to be responsible for any nightmares. Pretty gruesome, I know. So what is it? Well, it’s a failed experiment that proves two things: a) that I should never bake after midnight, and b) that just because something sounds good doesn’t mean it will be good, particularly when something I’ve never actually tasted before is involved. The unfamiliar element, as you probably guessed, was meyer lemons. This may come as a surprise to many of you, since these little mandarin-lemon hybrids have been old hat to North Americans for years. In Scotland, though, we just had regular lemons, and until I brought home a bag of meyers last week the closest I had come to tasting one was reading rapturous descriptions of their singular flavor. ‘Sweet’ was the one word everyone used, and it was precisely this that led me to assume these these orange-yellow beauties could stand in for other less-acidic citrus. 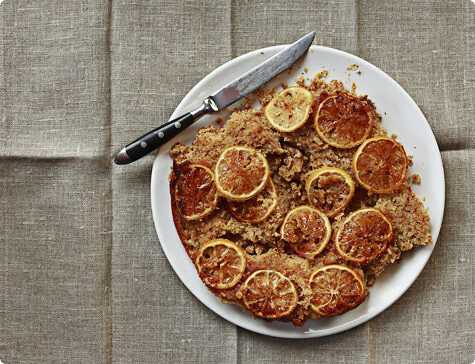 I was so confident of this, in fact, that I gambled on a recipe in which citrus plays just about every role in the show: Claudia Roden’s sephardic orange and almond cake, which, if you don’t know the one, makes a deliciously moist confection out of the entire fruit – pith, peel and all. And if that weren’t risky enough, I decided to up the stakes and and bake some lightly sugared whole lemon slices into the bottom – a kind of lemon upside-down cake, if you will – which would soften and caramelize and glisten attractively when the cake was turned out. Or so I hoped. Well, as you can deduce from the photo, this cake was a disaster in more ways than one. Yes, meyer lemons are slightly sweeter than regular ones, but not by much – even increasing the sugar slightly didn’t tame its mouth-puckering sourness. The bigger problem, though, was the peel, which is every bit as bitter as regular lemons, resulting in a cake so acrid I nearly gagged. And those delicate little lemon slices? They were bitter too, and about as tough as leather. Then, to add insult to injury, the cake fell apart when I turned it out of the pan too early, sending crumbs and leathery lemon slices everywhere (see above, baking after midnight). Honestly, the whole thing gave the word ‘failure’ new meaning. The experience was so traumatic, in fact, I was tempted to give up on meyer lemons entirely, but since I still had a couple lying around I decided it would only be fair to give them a second chance. But in what? Well, after chucking the remains of my disaster into the trash I poked through the fridge and found I had exactly what I needed to repeat a dessert I made for a small get-together at my dad’s house back in December, a sweet-tart lemon pudding cake from Lori Longbotham that everyone had loved, despite the fact that I botched the recipe by accidentally doubling the butter (which really wasn’t a problem, it just made it impossible to eat more than a very small serving). As good as this homely dessert was with regular lemons and twice the butter, with meyers (and the correct amount of dairy fat) it was sublime. It had no hint of acrid bitterness, just a delightful orange-lemon fragrance that was bright, sassy and delicately floral, with the kind of intriguing texture you might get if you crossed a souffle with a cheesecake – creamy, soft and light. We ate it curled under the blankets while watching a DVD the other night, and no offense to the movie, but this dessert stole the show – it was like a breath of warm, summery sunshine on a cold February night. It was not only good enough to erase the bitter taste in my mouth left by the previous disaster, it left me completely enamored of these lovely little fruits. I now understand perfectly why everyone gets so excited to see them come into season, since when used with care, they can transform good recipes into great ones. Just, please, if you ever hear the words ‘whole-meyer-lemon upside down cake’ exit my mouth again, lock me up in a lemon-less place until I come to my senses, okay? I should warn you: this version of the classic lemon pudding cake doesn’t separate into well-defined layers like many others do; instead it kind of gradually transitions from firm to soft. That said, it’s definitely the most delicious one I’ve ever had. There’s only one problem: I can’t for the life of me figure out what to serve with it. I tried whipped cream, but it’s really creamy enough without it; I also tried berry sauce, but the delicate meyer lemon flavor was overwhelmed. Some kind of fresh fruit might work, perhaps, or maybe a scoop of vanilla ice cream? Then again, it’s pretty darn perfect all by itself, particularly when you don’t have anyone but yourself to impress. Oh, and in case you don’t have access to meyer lemons, I’ve included proportions for regular lemons too. Preheat the oven to 350F/180C. Butter a 1-qt. (1-ltr) souffle dish. Have ready a large baking pan which will accommodate your souffle dish. Beat the butter at medium speed until light. Add the sugar and zest and beat until combined. Add the egg yolks, one at a time, beating well after each addition. Reduce speed to low and add half the lemon juice, half the flour and half the sour cream and beat until smooth; repeat with remaining lemon juice, flour and sour cream. Beat the egg whites at medium speed until foamy. Increase speed to medium-high, add the salt, and beat to stiff peaks. Add one-quarter of the whites to the lemon mixture and gently fold in. Continue to fold in whites one-quarter at a time. Transfer it to the prepared souffle dish. Place the dish in the larger pan and carefully pour boiling water around it to a depth of 1 inch (2.5cm). Bake for 50 minutes to an hour, until the top is golden brown, the center is just set, and the top springs back when lightly touched. Remove from the water bath and cool on a rack for 10-15 minutes. Lightly dust with powdered sugar before serving (I didn’t bother) and serve warm, scooping up some of the pudding at the bottom of the dish along with the cake. This looks simply divine! I can’t wait to make this. I have a friend coming to town and I think this would be the perfect surprise! Sorry ’bout your Meyer lemon misadventure but I’d say you thoroughly avenged yourself with that pudding cake. YUM. I’ve never used Meyer lemons but I think that is about to change now that I have your cake recipe in my hot little hands. Oh, and as for what the cake would go well with? A SPOON looks like the perfect accompaniment. I laughed out loud. I love reading your blog, ever since I stumbled upon it randomly. I also enjoy cooking, and hope to experiment with new recipes more often. Keep up the fabulous job you’re doing! I can’t think of a better word than ‘divine’ for how that pudding cake looks. I will have to make it, Meyer lemons or not. I love Meyer lemons and use them whenever I can, unless I really need the acid (they’re great preserved, but I learned you need to use regular lemon juice, not Meyer lemon juice! ).This weekend I made a lovely lemon-ginger marmalade, and a french lemon cream tart, both with Meyer lemons. I’m glad to hear you haven’t given up on them, they’re fabulous! I am so sorry to hear of your disaster with meyer lemon! It’s one of my favorite fruits, and I love it in lemon cream tart. But I am glad that you found a good use of those precious citrus in a delicious dessert in the end! Why not sprinkling the top with edible flowers? They are edible, not very strong, and would make it look slightly less rustic, slightly more dainty, but wouldn’t overpower it? I did nearly the same thing this weekend – baked a meyer lemon pound cake in the middle of a migraine and had the rare, but incredible disaster – a cake volcano actually. I also resorted to lemon pudding cake for the remainder of my lemons, though mine was the lemon buttermilk pudding cake from Blue Eggs & Yellow Tomatoes. My friend has a meyer lemon tree in her back yard and I "relieved" her of quite a few earlier this year. At the time, I candied the peel which is now sitting smugly in my freezer. The next time I see her, I will steal more lemons, because this sounds lovely. I recently had a friend try Meyer Lemons for the first time for her favorite Lemon Tart and was disappointed to lose the tartness. It became too sweet without the kick of lemon to balance out the flavor.Meyers make a divine marmalade and luckily, here in California, Meyers are a common backyard tree so all we have to do is knock on a neighbor’s door to enjoy the fresh citrus of Meyer lemons. I have sometimes sprinkled a few fresh berries in the bottom of my pudding cakes, before baking. Then there is an unexpected surprise here and there. On the west coast of the U.S. huckleberries come into season near winter so they are a great choice, if you can get them.For the person disappointed in the lemon tart — I use the juice of regular lemons, and the zest of Meyers, so the tartness is still therewithout overpowering the lovely flowery perfume of the meyers. Thank you for your post! Your description "a delightful orange-lemon fragrance that was bright, sassy and delicately floral, with the kind of intriguing texture you might get if you crossed a souffle with a cheesecake – creamy, soft and light" have inspired me to make this when my friend’s Meyer lemon tree is loaded down with fruits! Which hopefully is pretty soon! I can very much sympathize with your cake disaster; my only totally inedible cooking project as an adult involved Shaker Lemon Pie, you know, the one made with whole lemon slices? It looked beautiful, smelled great, and no one could gag down even a single bite. Bitter doesn’t even cover it. This, on the other hand, looks lovely! I love the look of this recipe. I just have to convert it to gluten free. I’m wondering if gluten free flour and Xantham gum could substitute for the flour. Margaret – I think this should be very easy to convert, since the flour plays such a minor role. Probably any standard gf flour mix would do the trick, and honestly I don’t even know if you’d need the xanthan gum since the texture you’re aiming for is more like a souffle than a cake. Anyhow, if you try it do let me know how it turns out! Had to comment, I have had great success in pairing meyer lemon desserts with buttermilk or creme fraiche sherbet. Cheers! If you’re really adamant about pairing the pudding cake with another flavour, consider a very lightly lavender flavoured ice cream. If you just want that visual colour contrast thing, how about dusting the top with powdered sugar and garnish with a spearmint sprig. That’s the best I could come up with, but I think Kate nailed it, "serve with a spoon." I love photos like the second one. It means that you got to enjoy a few bites while you are taking photos of it. Those are my favorite kind. … that looks fantastic. Oddly enough– how ’bout a drizzle of really intense chocolate sauce? Oh… yum… You know, I don’t think I would serve this with anything. It looks and sounds perfect all by itself! I think I’ll have to give this a shot this weekend. Happened across your blog and am thoroughly impressed. I agree that Meyer lemons can be very tricky to pair, however I have had wonderful success with fresh raspberry or blueberrie coulee drizzled around the plate. Delicious! "not pretty"? oh no no how i disagree – even your massacre is beautifully captured. i am in awe of your images. I love lemons and I would really love to try you lemon pudding recipe.And I definitely agree with you, never bake after midnight. I made it over the weekend with a simple gluten free tapioca/potato starch and brown rice flour mix. I also didn’t have Meyer Lemons handy, so I used regular old ones in the proportions suggested. It worked great. I’m not sure if it’s supposed to rise like a soufle (it did not). But it was creamy and delicious.I think I might cut the sugar down to 3/4 of a cup next time. It was a bit on the sweet side. baking after midnight is almost never a good idea, since it’s usually like those little bottles of hand sanitizers or trashy mags by the checkout counter — an impulse buy. and isn’t it so important to document the disasters? it’s like remembering a bad grade.but the pudding cake looks wonderful. i think i might try it with a honey curd. 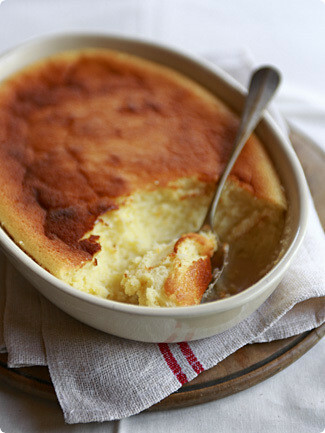 I am thinking of making the Meyer Lemon Pudding Cake but use Quark instead of sour cream. Has anyone ever try to use Quark as a substitution of sour cream? Any ideas or suggestions? Thanks! Oh goodness… that was a disaster! But I am happy to see you posted the picture and entire story without shame. And what redemption! That pudding cake sounds lovely. Oh Wow! Oh Wow! Love the photos and the recipes sound very inviting! I’m sorry to hear about the misadventure of the upside-down cake! Good thing, the second one came out flawles! beautiful blog.i also appreciate a blogger that can admit mistakes! pictures can lie and, believe me, i am no baker but that top photo makes me want to eat what is in the pic. if you hadn’t mentioned how horrible it was, i would want some! pics can lie.and that pudding cake. whoa. WHOA. must have. Sorry about the lemon cake but the pudding cake looks pretty good. Meyer lemons … I just got a bolt of longing. I just moved away from California to go to culinary school and I miss being able to walk down the street and pluck a lemon or two off a tree.Of course, my neighbors are probably delighted that their trees are suddenly doing so much better these days!Cheers. Sorry about the disaster, but your story made me smile. I love Meyer lemons most in curds and custards, and this pudding cake sounds just right! I don’t think that your meyer lemons "massacre" looks so bad =) I usually finish with a messy and unclassifiable thing when I try to cook potato croquettes…I tried it a lot of times, but my family usually finish eating them as pure. Anyway, they look horrible…but taste delicious! I am sorry for the upside down of the cake….pudding cake sounds delicious…thanks for sharing your recipe…it looks great…. right away get the ingredients from http://www.myethnicworld.com and gonna try it. This is my first time stopping by your site. You have an awesome sense of humor and writing style. Look forward to seeing what you cook up next! If I could make a suggestion, one of my favorite thing to do with meyer lemons is to make preserved lemons, which is used a lot in Moroccan, Egyptian and other cuisines. There are several good recipes on the internet, but the basics are just lemons, kosher salt, lemon juice and (if you like) peppercorns or other savory spices. Stick them in a canister and let them pickle for about a month. The result is absolutely delicious and will add amazing touches to your dishes. Bon Chance! I have a Meyer lemon tree which has produced for decades. Two things about Meyers: they have no real season — they produce year-round, and for some recipes, like meringue pie, they lack the acidity to gel the mixture. Enjoy! This looks like something my grandma used to make. Nothing more comforting than warm dessert you can eat with a spoon. Thanks! i just hope looks wont be deceiving since that’s a mouth watering meal. The Meyer lemon cake looks incredible and certainly makes up for the monstrosity above 🙂 . love your blog, melissa! i’m new to the blogging world and haven’t read up on many travel/food blogs yet, but i came across yours and am inspired. so fun to read, and so many similar interests. anyway, i’m excited to experiment with a big basket of lemons that my friend recently gave me from her tree–they aren’t meyers, but i love them just the same. so far i’ve just made some mint lemonade, but i will definitely try baking this pudding cake! and by the way, i had a similar lemon upside down cake disaster a couple years ago–i had such high hopes–however not only was it bitter, but some of what i expected to be nicely caramelized was instead burnt around the edges. I just made this for the first time & just finished a small bowl of it. It’s so delicious! I love the warm creaminess of it. Thanks for the great recipe.